Israel Itah tells Arutz Sheva about beating he suffered near Damascus Gate, which Arab police officer stopped by helping attacker flee. Israel Itah, a haredi youth from Jerusalem, told Arutz Sheva about a recent incident near the Old City's Damascus Gate, in which an Arab man struck him severely. To his surprise, a nearby Arab police officer helped the attacker go free while telling Itah to leave the area. "I walk to the Kotel through the Damascus Gate a lot but experienced a unique incident during Ramadan. I didn't know there would be so many people. I went through when it was very crowded and the whole way suffered curses and spitting. The police didn't do anything. They're allowed to do whatever they like and everyone who passes there feels it. The Arabs spit on you and curse you. Sometimes it happens more, other times less, but it's a regular occurrence there. "I was with a bike. An Arab blocked my way. I waited behind him for them to clear the way, but a wave of Arabs passed through. He didn't let me go through. When the group arrived he moved to the side. I tried to go around him, but apparently he was very offended that I passed him... He ran behind me. I looked and saw him next to me. I knew that there were two police officers behind the wall." While Itah tried to reach the officers, the Arab man grabbed him. "He grabbed me by my peyot and threw me to the ground. He hit and punched me. Another Arab came out of the nearby falafel stand and he also hit me. It was a miracle that I got out. Fortunately a tourist came by and protected me." He added that the Arab ripped his peyot during the attack. "Worst of all, two police officers were located behind the wall. I yelled for them to come help me. The officer came, grabbed the Arab and told him to come along. I asked him to arrest the man because I wanted to file a complaint, but the officer told me to continue on. I was in shock. I had been beaten, my head hurt, and he didn't care at all," Itah added, noting that he felt the officer was trying to help the attacker get away. "I went to the Kotel station. The officer took the incident seriously and sent officers with me to the same point. When I returned to the scene of the attack, I saw that the officer had an Arab name and I understood what had happened." 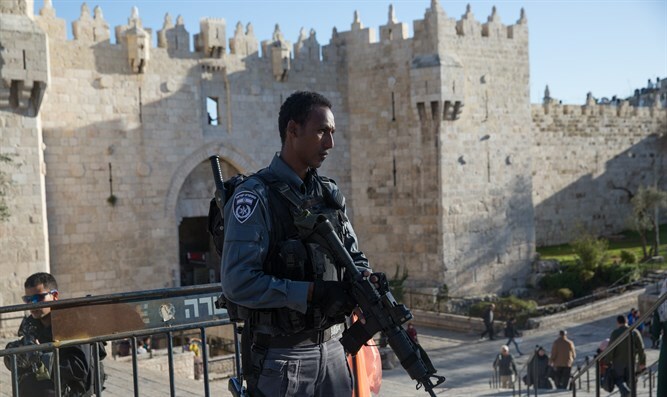 The attacker was identified through security cameras, though Itah claims that he was released without restrictions, while Itah himself was told to stay away from the Damascus Gate for 15 days and let out on a 3,000 shekel ($770 US) bail. A police spokesperson stated: "An investigation revealed that the complainant, who was riding on his bicycle in the Old City, struck bystanders and then hit a local man. A fight broke out between the two of them. Both sides were detained for questioning, at the end of which they were released under conditions including the requirement to stay away from the area. In addition, and in light of the complainant's appeal, all of the relevant materials have been given to the internal investigation department."